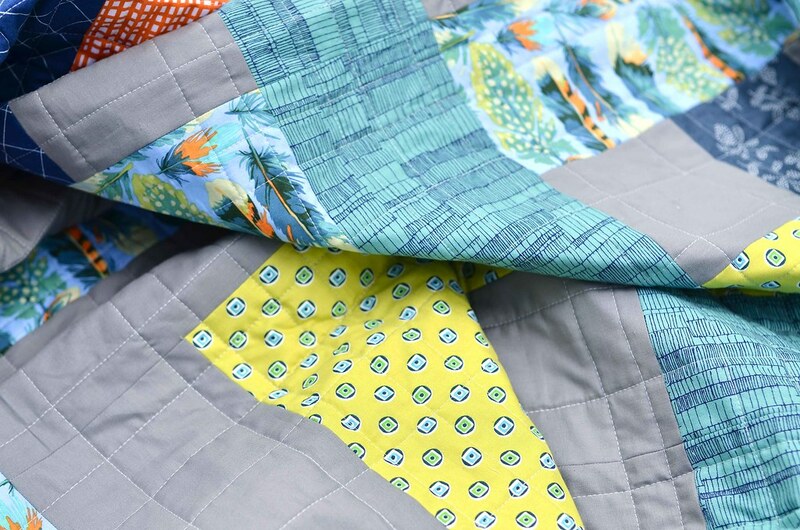 After I posted my pattern testers' quilts last week, I wanted to make a follow up post with a few more details about my own version of the Eliza Quilt. I had so much fun making this pattern and I wanted a little more space to talk about it. 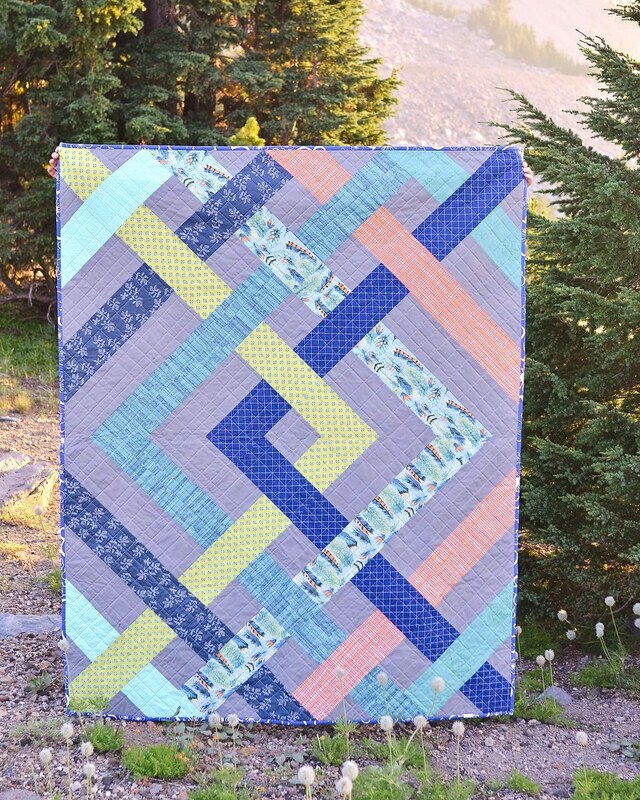 The idea for this quilt came from my Betty Quilt pattern. I wanted to do something along the same lines (but a little bit different) because I really enjoyed how well it highlighted the fabrics and how easy it was to put together. My color inspiration for the quilt came from the Martha Negley feathers print that I have been hoarding for a while. I adore the print and it has such amazing blues and greens and teals. After I picked the initial focal fabric, I picked several coordinating fabrics from my stash. 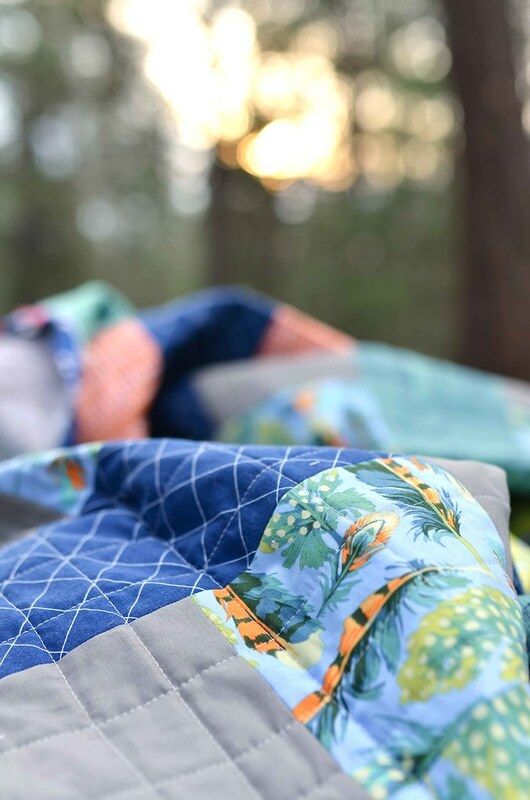 My favorite designers for coordinating fabrics are Carolyn Friedlander, Denyse Schmidt, Lotta Jansdotter, Cotton + Steel Basics, and Lizzy House and I used almost all of them in this quilt. This is definitely not an all-inclusive list, but I have found that they all make beautiful fabrics that work well with other collections and they are the designers that I buy most frequently. Thank you to those who have purchased the pattern, I can't wait to see what everyone makes! If you make your own version, I would love it if you could use the hashtag #theelizaquilt and/or #kitchentablequilting on Instagram so I check it out! Want to make your own? Head over to my shop buy your own copy of the pattern! Very nice quilt. I'll have to go see your other patterns. Thanks for sharing. 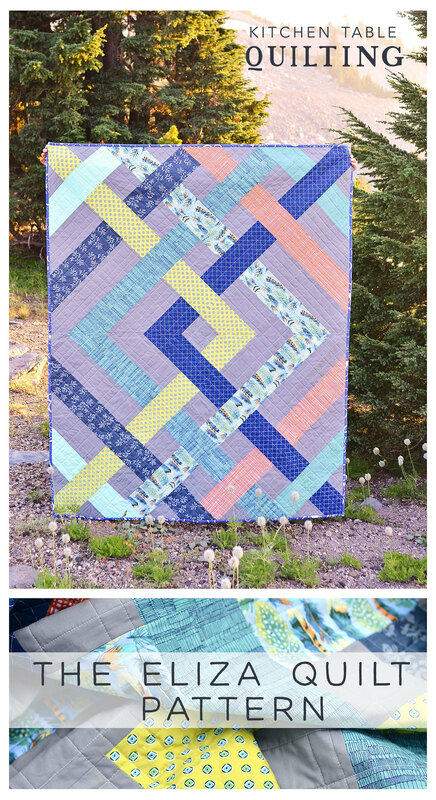 I love the big bold pattern...great quilt! Looking forward to seeing more! Thank you Carol, you are too sweet! The colors are stunning together, great presence!